Upstarts or old guard, who wins the hearts of EV buyers? 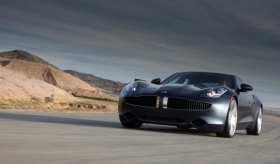 With the Karma, Fisker aims to steal customers away from BMW and Audi. A David-vs.-Goliath battle is taking place to win the hearts and wallets of electric car buyers. Tiny upstarts such as Norway's Think and Fisker Automotive of the United States feel they have the advantage because all they do is electric or plug-in hybrid cars. Meanwhile, established automakers such as Nissan Motor Co. and Daimler AG believe customers will want their electric cars to come from companies with decades of experience. "I think they'll wait for a name brand," Nissan Europe Senior Vice President of Manufacturing Trevor Mann told Automotive News Europe. "We think with Nissan we have a good heritage in technology and engineering. We make extremely good quality vehicles. We will deliver all of that with electric." Nissan launches the Leaf full-electric car in Europe, the United States and Japan this year. In a separate interview with ANE, Daimler Chief Environmental Officer Herbert Kohler said: "For me it is rather logical that they will look to Mercedes for those kind of cars and not the others because nobody knows how long those (newcomer) companies will exist in the future." Daimler currently offers a limited number of full-electric Smart ForTwo minicars in Europe. Volume production of the car at Daimler's plant in Hambach, France, is set to start in 2012. Henrik Fisker, CEO of Fisker Automotive, doesn't believe his company is at a disadvantage when competing against automotive giants. 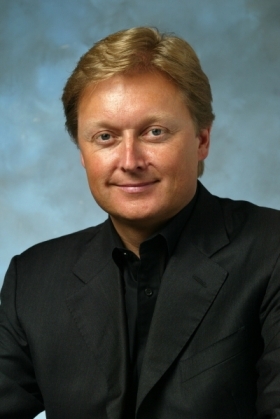 Henrik Fisker: "Were do you think we get our customers from? They come from BMW, Mercedes, Lexus and Jaguar, Audi and Porsche." "Were do you think we get our customers from? They don't come from nowhere. They come from BMW, Mercedes, Lexus and Jaguar, Audi and Porsche," Fisker told ANE. "They come because they want to identify themselves with a brand that is environmental friendly and stands for something new that fits into their new lifestyle. That's why I think this is the perfect time for us to start as a new car company." Think CEO Richard Canny agrees: "This is an amazing revolution in the industry and it is going to turn things upside down." Fisker and Think both work with Finnish contract manufacturer Valmet Automotive. Valmet has been making the Think City full-electric minicar since last December. The City is available in markets such as Norway, Austria, Spain and the Netherlands. U.S. production is scheduled to start in early 2011. Output of the Fisker Karma plug-in hybrid luxury sedan starts in Finland later this year. While the four executives dispute which companies have the early edge, a recent study shows a brand hierarchy already exists in the minds of customers who are considering an electric car. Deloitte Consulting found that 17 percent of consumers would prefer to buy an electric car from Toyota Motor Corp., 15 percent from Honda Motor Co. and 12 percent from Ford Motor Co. 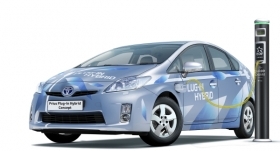 The plug-in version of the Toyota Prius is due to launch in 2012. Honda has not even revealed launch plans for electric cars while Toyota has announced it will launch a plug-in version of the Prius in the United States in 2012. Nancy Gioia, Ford's director of global electrification, said the U.S. automaker will debut a full-electric version on the Transit Connect commercial van in the United States later this year and in Europe next year. The battery-powered Focus Electric launches in Europe in 2012 following its 2011 U.S. debut. Ford also plans to introduce two hybrids and a plug-in hybrid in Europe in 2013. General Motors Co.'s Chevrolet brand, which launches the Volt plug-in hybrid in the United States this year, was fourth in the Deloitte survey at 8 percent, and Nissan was ninth at 4 percent. California-based Tesla Motors, which already has a high-performance electric car on the road in Europe and the United States, was at 2 percent. Deloitte says that brands such as Chevrolet, Nissan and Tesla might have to spend more on marketing. Frost & Sullivan says it is too early to say whether upstarts or established brands will have an early advantage. "What we need to remember is that someone buying an EV right now, an early adopter, is willing to overlook some of the limitations of the vehicle," he said. "For them, it's all about owning an electric vehicle."